Dave Lindsay, a Michigan Department of Environmental Quality geologist, took this photo of pipeline sleeves from the site of a November 2017 pinhole leak along Enbridge Energy’s Line 5 in Crawford County. LANSING — Last November, just a day after Gov. Rick Snyder announced an agreement demanding a host of safeguards along Enbridge Energy’s Line 5, state environmental regulators received an alert. The pipeline had sprung a leak near a creek in a swampy patch of Crawford County, according to an email from the U.S. Coast Guard’s National Response Center, an emergency call center that fields initial reports for pollution and railroad incidents. The leak, about 25 miles southeast of Gaylord, left an oil sheen atop groundwater surrounding the pipeline before it was quickly cleaned by Enbridge, a Canadian energy giant, according to Department of Environmental Quality emails. He told Flint to ‘relax.’ Now, Michigan is paying him to lead media training. It was the second small Line 5 leak regulators learned about that month, Bridge Magazine and the Michigan Campaign Finance Network discovered after a review of Department of Environmental Quality emails obtained using the state’s Freedom of Information Act. Less than three weeks earlier, Enbridge reported a bubble of oil squeezed through a pinhole leak in the Upper Peninsula’s Iron County. Neither leak significantly damaged the environment, according to Enbridge and the DEQ. Neither came close to the nightmare scenario many fear — a rupture in the choppy Straits of Mackinac that could spread into Lake Michigan or Huron. But the November leaks and others in years past demonstrate risks along the entire pipeline that crosses nearly 400 bodies of water in Michigan en route from Superior, Wisc. to Sarnia, Ont., environmentalists and watchdogs say. Several risk factors — including “a history of failure” on segments outside of the Straits — should prompt close scrutiny of Line 5’s route on land, said Richard Kuprewicz, president of Accufacts, Inc., a Redmond, Wash. consulting company that evaluates the safety of pipelines for governments, industry and other groups. “We’re all talking about Mackinac, but what about all this mileage going through all these sensitive wetlands?” said Kuprewicz, who doesn’t work with Enbridge. 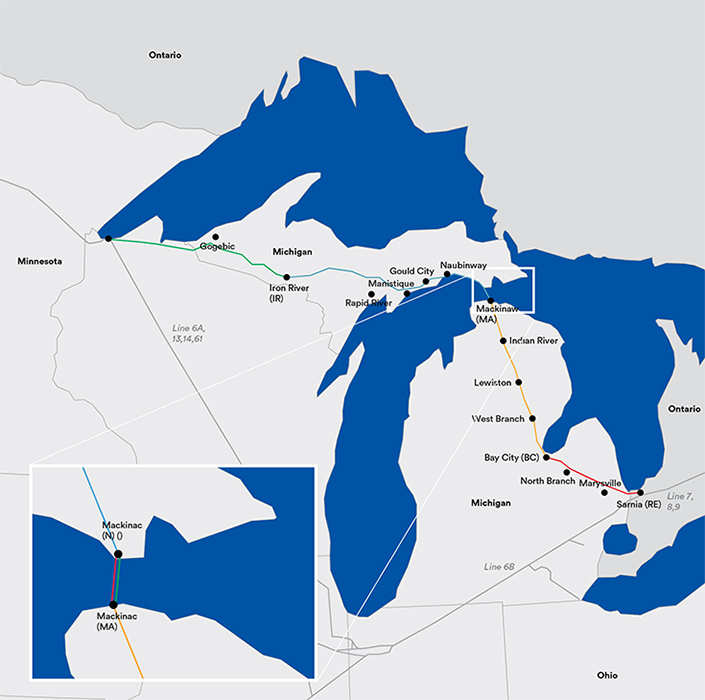 Line 5 crosses treasured waters such as the Au Sable, Black, Indian, Manistique, Rapid and Sturgeon Rivers, as well as Lake Gogebic, according to a report from Enbridge late last month. They are among the 74 crossings considered a “priority” by the company because they could be vulnerable to a spill. Enbridge says it has bolstered safety along Line 5 since another one of its pipelines, Line 6B, ruptured in the Kalamazoo River in 2010, spilling more than 1.2 million gallons of crude oil in the largest inland oil spill in U.S. history. And the company plans to add further safeguards to the higher-risk areas. “Since 2010, Enbridge has been under continual scrutiny and audit, and continues to demonstrate robust and effective management systems focused on safety and continuous improvement, while continuing to improve safety performance,” the company wrote in its report to the state on water crossings. Critics hold little faith in such assurances. “Enbridge claims their world-class pipeline safety measures will keep us safe but the reality is we have seen time and again failure after failure,” Anne Woiwode, chair of the Sierra Club’s Michigan chapter, said in a press release late last month. The spotlight usually shines on Line 5’s twin pipelines in the Straits, and for good reason. It’s where experts say cleanups could prove exceedingly difficult in the unlikely case of a rupture, particularly during an icy winter, jeopardizing the health of the Great Lakes. Last month, Enbridge released a state-required report calling it “feasible” to replace the Straits segment with a new line buried 100 feet below the lake bed in a tunnel that would “virtually eliminate any risk” of a spill. Snyder has voiced support for the idea, which Enbridge said would take up to six years of planning and construction and cost up to $500 million. Enbridge is allowed to operate the pipeline in the Straits because of a 1953 easement from the state, which gives Snyder leverage over its future. He is expected to announce next month whether Line 5 should be shut or partially replaced. Environmentalists generally oppose the tunnel idea, saying it would essentially ensure the pipeline would operate in perpetuity. Line 5 has never leaked in the Straits, but it has elsewhere. In a 2017 report based largely on federal data, the National Wildlife Federation estimated 29 known spills, ruptures and equipment failures along Line 5 had released more than 1 million gallons of oil and natural gas liquids since 1968. “This new information causes us grave concern about the integrity of the inland pipe system, inconsistencies with spill reporting, and the effectiveness of leak detection systems,” Beth Wallace, the NWF pipeline specialist who created the database, said in a statement at the time. But the biggest spills were decades ago, according to the report. That includes three Upper Peninsula spills totaling about 395,000 gallons in 1968; a leak of 252,000 gallons near the U.P.’s Iron River in 1972; a 210,000-gallon leak near Lake Gogebic in 1976; and leak of 222,600 gallons of oil and gas — accompanied by an explosion — in 1999 that scorched a utility pole in Crystal Falls, triggering a power outage and hundreds of evacuations nearby. Pipelines are often seen as a safer way to transport petroleum than alternatives like trucks or trains, but state leaders of both parties have talked tough about scrutinizing Enbridge in part because the company has a checkered record on transparency. But the mounting Line 5 concerns put state environmental and energy regulators in a tricky position. Michigan— like most states — doesn’t regulate hazardous liquid pipelines or those that cross state lines. The task instead falls to the federal government, whose Hazardous Materials Safety Administration (PHSMA) oversees more than 2.7 million pipeline miles with 208 inspectors and staff — a team that is spread so thin the agency often leaves inspections to industry. As a result, Michigan must rely largely on Enbridge’s own reports on the pipeline’s condition outside of the Straits. Elsewhere, Enbridge has easements with private landowners or others whose property the pipeline traverses. “If it weren’t for the fact that this pipeline sat on the bottom of the Great Lakes — that 4-mile piece of it — the state wouldn’t have a role,” said David Holtz, communications coordinator for Oil and Water Don't Mix, a coalition of groups opposed to the pipeline. State officials say they have made strides in recent months to glean more information from Enbridge about conditions along all 547 miles of Line 5 in Michigan, spurred in part by a privately negotiated agreement with the company Snyder announced in November. That agreement required Enbridge to study alternatives to Line 5, with two independent experts paid for by taxpayers to ensure the veracity of the reports. Enbridge also agreed to improve underwater monitoring in the Straits, swap a Line 5 segment beneath the St. Clair River for a tunnel-protected line and study ways to improve safety at other water crossings. Enbridge says it has improved pipeline reliability since the Kalamazoo spill. The company claims it has pioneered what it calls “reliability engineering science” that can measure safety levels at each part of the pipeline. Enbridge estimates the odds of a “major loss” on a Line 5 segment at 1 in 100,000. Before that, the pipeline leaked about 820 gallons of crude outside of Standish in 2012 due a “material failure of pipe or weld,” according to federal data cited in the NWF report. There were at least two more recent leaks, according to emails obtained by Bridge and the Michigan Campaign Finance Network covering all of 2017. The first was Nov. 11, 2017, a Saturday, in Iron County, which was described in DEQ communications as a “pinhole” leak where just a bubble of oil escaped. “While a pinhole leak with no release is not news, it is Enbridge,” Steve Casey, a DEQ district coordinator for water resources in the U.P., wrote to colleagues, informing them of the mishap the following Monday. 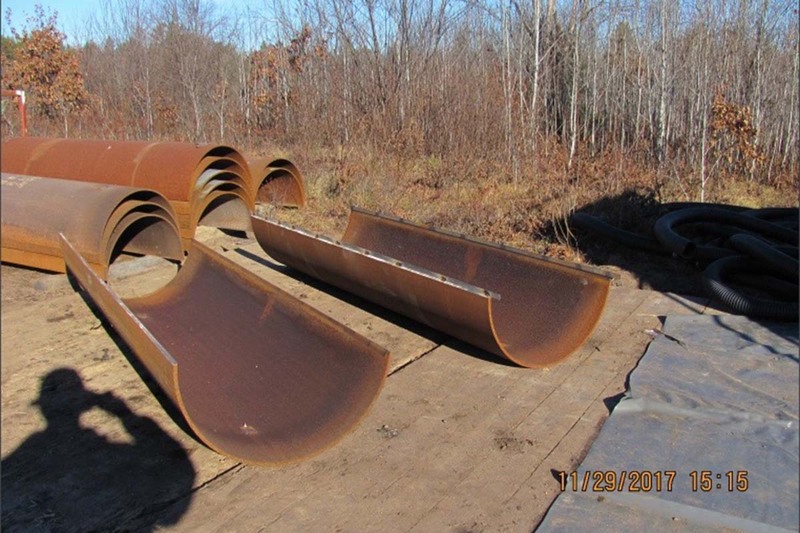 Later that morning, a DEQ geologist emailed an update after talking to Enbridge: After spotting the leak following an integrity test, the company sandblasted off the pipeline’s outer coating, welded a sleeve over the leak and covered the pipe back up, the email reported. The pipeline, shut down on Nov. 11 during the repairs, was running again by the next day, according to the emails. “These cases show our pipeline integrity management program is working as intended to ensure the safe operation of Line 5,” Enbridge spokesman Duffy told Bridge, referring to both leaks in November. On Nov. 28, the Coast Guard’s National Response Center sent out another Line 5 alert. That time, the pipeline had leaked near a creek just outside of Lewiston. The agency quickly dispatched Dave Lindsay, a geologist in the Gaylord field office, to observe the cleanup and take photos. Enbridge reported less than a gallon of crude had leaked. Lindsay wrote in internal emails and said in an interview he wasn’t so sure. He agreed the leak was small and didn’t seem to cause much environmental damage, but he questioned how the company arrived at such a small estimate. Enbridge had flagged the problem during an inspection but didn’t know how long the pipeline had been leaking before the company dug down to patch it, Lindsay wrote in an email to his colleagues. “You only do these inspections every six months. So you don't know how long it was had been releasing,” he told Bridge. Lindsay said Enbridge told him its crew used absorbent pads to clean up a sheen atop the groundwater surrounding the pipe. He saw Enbridge set up a system that pumped any potentially tainted water uphill, where it was filtered through straw before it drained through gravity. Enbridge found petroleum compounds in the soil surrounding the pipeline, Lindsay added. It appeared those soils had blocked the oil from traveling far. Enbridge pegged the cost of environmental remediation at $12,000 in Crawford County, according to federal Pipeline and Hazardous Materials Safety Administration data. Kuprewicz, the pipeline expert, said that number sounded low. Duffy, the Enbridge spokesman, declined to answer what that cost entailed, or how it calculated how much oil spilled. “No measurable amount of oil product had been released,” in either spill, Duffy said. Brian McLachlin, who owns a cottage near the Crawford County leak, said he saw heavy machinery tending to Line 5 for at least a week that November — long enough to alter his hunting plans. The pipeline’s easement carves a pathway through wetlands that McLachlin and his wife Sheila often drive as they seek out deer, turkeys and even bears. McLachlin figured Enbridge was only performing “routine maintenance” on the segment. He didn’t know that workers had patched a leak until a Bridge reporter told him. Over the past decade McLachlin said he’s seen crews digging up the pipeline five or six times over a mile-long stretch. Now he wonders if that means Enbridge has detected other problems along the line. Asked that question twice by Bridge over email, Enbridge’s spokesman, Duffy, didn’t answer. When I read articles like this I often have an impulse to request clarification from the parties involved, since they are elected officials. It would be great if you would provide links that would allow us to quickly send a message. In this case, it would be great if you would embed a link to the governor's and the attorney general's office.